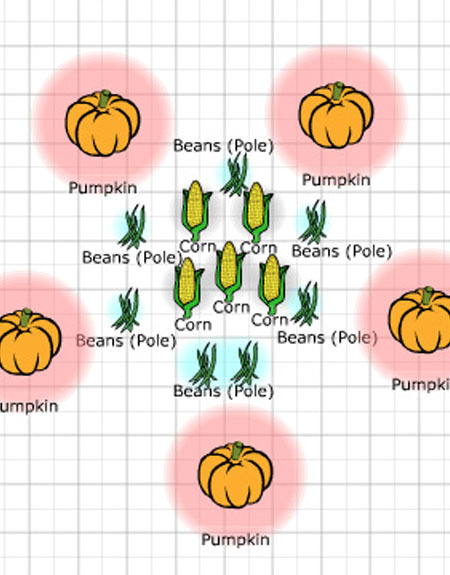 Three hundred years ago, when early American colonists took a look at the food gardens in Native American villages, they often saw a unique companion planting plan – sweetcorn, climbing beans and pumpkins or squash being grown together in the same plot. Compared to the neatly ploughed rows and fields of Europe, these “corn gardens” looked suspiciously wild, but for the Iroquois, Cherokee, and other Native American tribes who grew Three Sisters Gardens, their success amounted to a minor agricultural revolution. With cleared land at a premium, here was a way to grow three nutritious, easy-to-store crops in one space. More recently, I’ve started filling gaps in rows of sweet corn with climbing beans, a three sisters technique that works great if you get the timing right (keep reading). True, companion planting corn and pumpkins or corn and beans involves only two sisters, but you are still looking at growing two crops rather than one in the same amount of space. Adding a third plant limits your access to the others, which is not an issue when all the crops are harvested when fully mature – dry grain corn, hard storage squash, and dry beans. However, simplification is needed if you’re growing sweet corn and/or French beans, which are harvested when immature, and not all in one day. It is impossible to tiptoe through the squash vines to pick French beans without doing significant damage. That said, I think the Three Sisters concepts work best where there is enough space to capitalise on the plants’ shared benefits. The more I have played with this 20-foot square plan, the better I like it, mostly because it uses interplanting techniques that have proven successful in my garden. When I grew prickly spaghetti squash by my beans, deer and other pests had a hard time finding the beans. Sunflowers are stars wherever you grow them, and they make great companions for fast-growing bush beans.